Our bumblebees are not aggressive but if you handle them carelessly or step on them with bare feet they will sting, as in other similar circumstances. 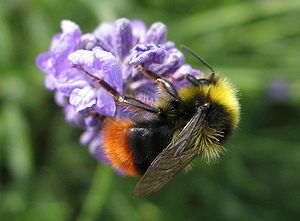 Their usual behaviour on being disturbed is that the bumblebee lies on its back flailing its feet towards the intruder. 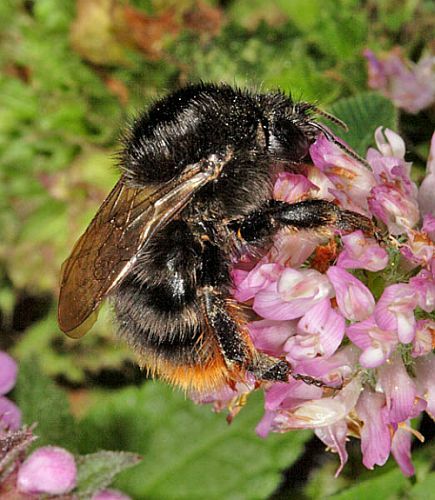 The thorax of the early bumblebee has one yellow stripe and the rear tip of the abdomen is red. 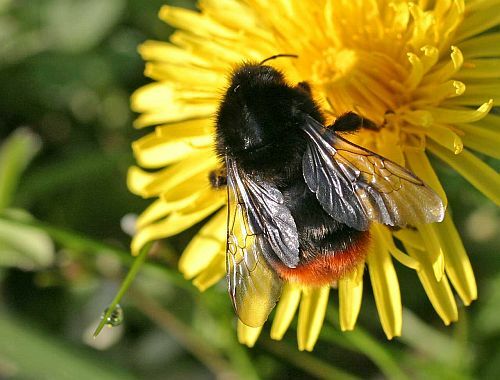 Red-tailed bumblebees build their nests in stone walls, in burrows in the ground and cracks in house basements; other suitable places are found too. Quite similar to the red-tailed bumblebee is the red-shanked carder bee and it takes a specialist to note the minmal differences. Both species are quite often encountered.